With two Grade 1 wins at Oaklawn last weekend, Mike Smith was voted Jockeys' Guild Foundation Detox Jockey of the Week for April 8-14, 2019. The award is voted on by a panel of experts for riding accomplishments by members of the Jockeys' Guild, the organization which represents more than 950 riders in North America. Jockey of the Week is sponsored by FoundationDetox.com, America's #1 Equine Toxin Remover. Omaha Beach is owned by Fox Hill Farms and trained by Richard Mandella; this will be Mandella's first Kentucky Derby starter since 2004. Smith returned to the winner's circle on Sunday in another Grade 1 event, this time aboard Midnight Bisou ($3.80) in the $750,000 Apple Blossom Handicap. It was the third consecutive win for the Steve Asmussen trainee and her eighth career victory in 14 starts. Smith won three races last week; in addition to the two stakes victories, he won a maiden special weight on Arkansas Derby day with Verve's Humor ($8.80) for trainer Dallas Stewart and owner/breeder Charles Fipke. He finished the week in the money in five of his seven starts. 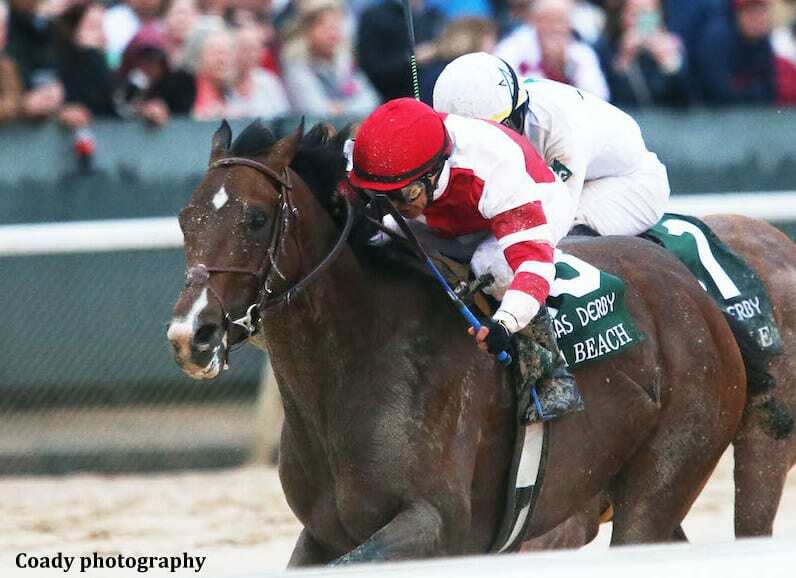 This entry was posted in People and tagged Apple Blossom, arkansas derby, Horse Racing, jockey, jockey of the week, jockeys guild jockey of the week, jockeys' guild, midnight bisou, mike smith, Oaklawn, oaklawn park, omaha beach, road to the kentucky derby by Press Release. Bookmark the permalink.